Search for the best flight prices from Stansted to Dusseldorf. Compare prices, book today and save money with Stansted Airport. 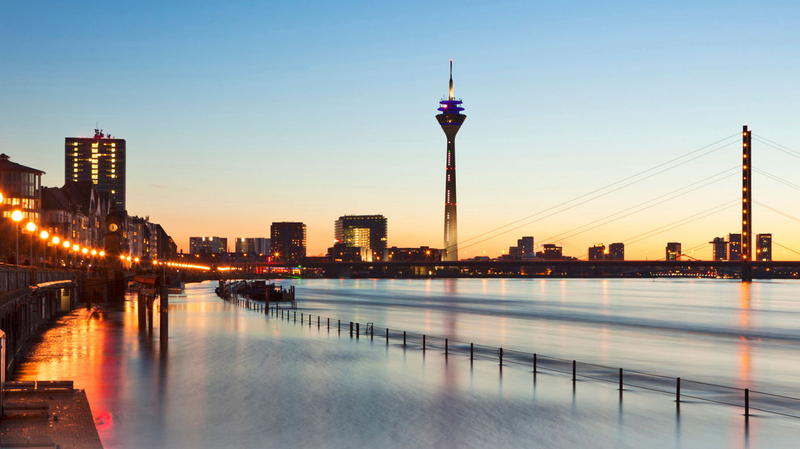 Leading the way in economic and artistic endeavour, Dusseldorf boasts an energy and style that rivals most other European cities. A strong multi-cultural community means almost every type of food is available, while stylish, boutique stores and ultra-modern hotels are never in short supply. Dusseldorf can lay claim to being at the forefront of both Germany’s economic and artistic progress, and the cityscape wields a clash of modern glass skyscrapers and avant-garde architecture. Perhaps the most luxurious of the city’s five-star hotel offerings is the Steigenberger Parkhotel (Königsallee 1a), which boasts a sauna suite, rainforest shower and sumptuous rooms. However big-name chains such as Hilton (Georg-Glock-Strasse 20), Hyatt (Speditionstrasse 19) and InterContinental (Königsallee 59) all compete for the five-star crowd. A more affordable option is the Hotel Stadt München (Pionierstrasse 6), although it still provides a fitness suite and spa for its guests. B&B Hotel (Kettwiger Strasse 6) meanwhile is a great stylish choice for the budget traveller. Modern malls and department stores dominate Dusseldorf’s shopping scene, with KÖ-Galerie (Königsallee 60) the most famous, offering more than 130 shops. Both local and international brands can be found at Sevens (Prinz-Georg-Strasse 83) and Stilwerk (Grünstrasse 15), while those enthralled with their designer label should head to the upmarket mall Schadow Arkaden (Schadowstrasse 11). The area around Schützenplatz is great for weekend antique fairs and flea markets, while the Altstadt area hosts a selection of small boutiques that sell everything from designer goods to kitsch souvenirs. The dining scene in Dusseldorf reflects the city’s culturally diverse population, which is one of the most multicultural in Germany. The discerning tourist will be happy to gorge on the traditional Rhenish cuisine and beer at breweries such as Brauerei im Füchschen (Ratinger Strasse 28), although locals are more likely to be found at Spanish eatery Las Tapas (Schneider-Wibbel-Gasse 4), Italian trattoria La Castagnas (Rossstrasse 9) or Japanese restaurant Monkey’s East (Graf-Adolf-Platz 15). There is a pleasing choice of Michelin-starred restaurants in Dusseldorf, including the traditional Victorian (Königstrasse 3a), and the excellent Nagaya (Klosterstrasse 42), which offers a highly-regarded sushi buffet, while blending European and Japanese cuisine. In the region of 300,000 music enthusiasts are drawn to one of the biggest jazz festivals in Europe each year, in order to enjoy a weekend of shows and impromptu performances. Over 500 musicians contribute to the extravaganza, which takes places across some 35 stages and encompasses jazz, blues, rock, funk and soul. Renowned musicians and up-and-coming artists combine to put on this large festival that is laid on at the leafy Grafenberg forest racecourse. An international crowd gathers each year to celebrate the best of pop and clubbing culture. Over four million people are drawn to this huge annual summer fair that is one of Germany’s largest. Beer tents and food stalls complement the amusement park rides, workshops and other activities and events. This festival runs for five days and puts on a select number of superb performances from talented musicians across two of Düsseldorf’s most beautiful concert halls.